A residential remodeling or construction project is not complete without the proper floor treatment. There is a myriad of options available when it comes to flooring solutions, but there are few flooring options that can convey such a sense of style and elegance as hardwood flooring. The natural beauty and integrity of each wooden floorboard shines through to complement any décor and, with the proper care and maintenance, can last a lifetime. The team at TriStar Repair & Construction has extensive experience with installing this beautiful floor treatment, making us one of the most sought-after hardwood flooring installers in the Dallas–Ft. Worth metroplex. Our hardwood floors do not house airborne particles or dirt, which allows for a cleaner living environment. Hardwood flooring is easy to clean, generally resists spills and stains and is relatively simple to repair should it sustain any damage. 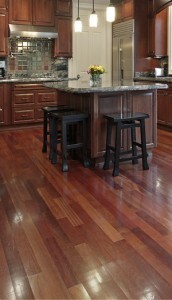 Hardwood floors add natural beauty to any room and value to your home. No matter what size, color or wood species you choose, TriStar Repair & Construction can provide you with the ideal solid wood or engineered hardwood flooring solutions. TriStar Repair & Construction has been one of the most trusted remodeling and construction companies in the Dallas–Fort Worth metroplex since we started doing business in 2006. North Texas residents have turned to us for countless kitchen remodeling projects not only because of our outstanding work, but also our dedication to providing only the best customer service. We understand the remodeling process can be hectic at times, but we promise to do our absolute best to make the transition from your old kitchen to your new and improved kitchen as smooth as possible because at TriStar, we are not satisfied until you are! When it is time to replace the flooring in your home, consider having TriStar’s team fit it with one of our beautiful hardwood flooring solutions. Whether you desire a space with a sophisticated, modern allure or more of a rustic, hand-scraped aura, TriStar has the perfect hardwood flooring solution for any home. If you have any questions or would like to speak with a TriStar team member regarding your specific flooring project, call us at (940) 381-2222, or send us a message. We will be glad to assist you in deciding which hardwood flooring option is the best fit for your home! It is essential to consider your project’s budget constraints before any remodeling takes place. If you need a quote before you begin the renovation or construction process, we are happy to give you one. © 2013 TriStar Quality Roofing. All rights reserved.